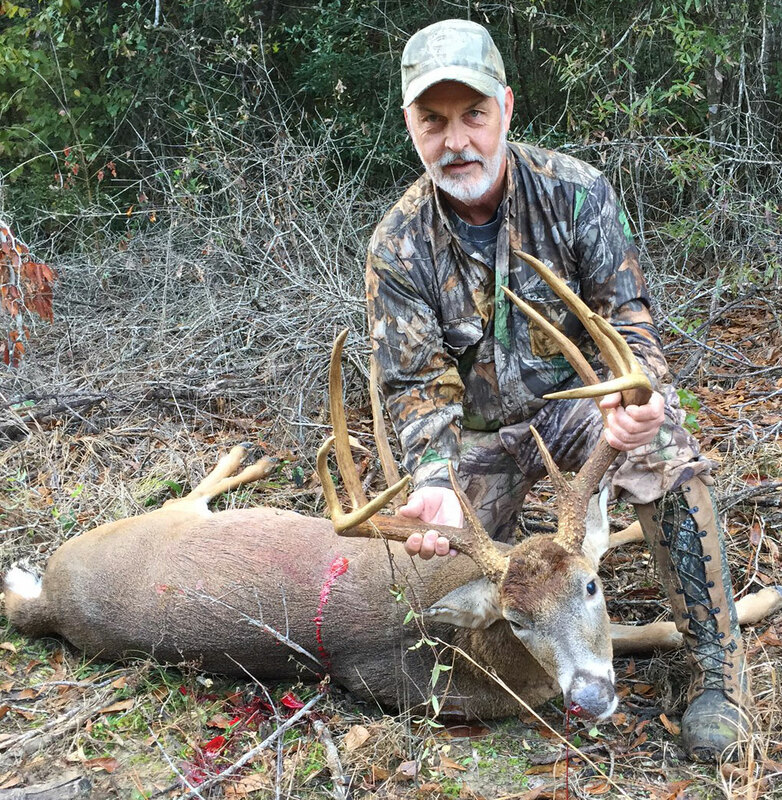 Larry Bringol, of Youngsville, poses with the big Natchitoches Parish 10-pointer he shot on Nov. 18 near Provencal. The buck green-scored about 173 inches of bone. 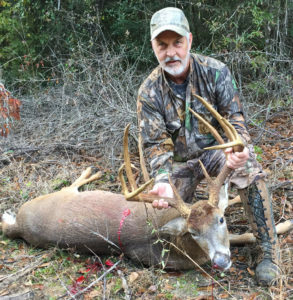 Larry Bringol had a lengthy history with a big 10-point Natchitoches Parish buck, that until Nov. 18 at least, was filled with heartache and despair. 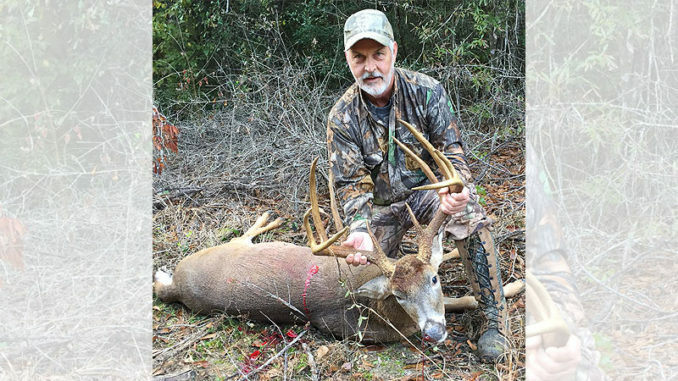 Just two weeks prior in early November, the 58-year-old Youngsville hunter missed a crack at the high-antlered buck when it showed up unexpectedly in the cutover he was watching from his box stand on his lease near Provencal. “The doe came out and she kept looking back, and I thought she was waiting on her yearlings because I had a bunch of pictures of a doe and two yearlings,” Bringol said. “She went on across and I didn’t even pick my gun up — and then he came across. By the time I picked my gun up, I could just see his head inside the right-hand wood line. And back in 2015, what he thinks was the same buck eluded him from just 90 yards when he had scope issues. Larry Bringol made the most of his third opportunity with this big buck, and dropped the 10-pointer from 200 yards on Nov. 18 near Provencal. 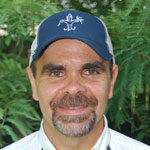 But on the morning of Nov. 18 around 7:30, Bringol was on high alert when what he suspected was the same big doe he had seen two weeks earlier appeared about 200 yards down the power line. “As soon as I saw her, I raised my gun up and turned my scope up to seven to make sure I could get a shot if he came out,” he said. About 15 seconds later, the buck appeared — and this time Bringol fired his .30-06 and the big deer fell where it stood. When he eventually got down and saw the heavy-horned, symmetrical 10-point rack up-close in person, that’s when he got a little nervous. The big 10’s rack features tall tines, with about 5-inch circumference bases, and was green-scored by his taxidermist at 173 inches. The buck weighed 201 pounds, and was estimated to be between 4 ½ and 5 ½ years old. Last year, Bringol knocked down an 8-pointer that stretched the tape to 142 inches on the same lease, and figured that was his buck of a lifetime. But the 10-pointer definitely raised the bar.